Every houseboat captain has their own method to secure their boats, and very likely "spring lines" are part of the equation. Dock lines are a very important part of the boats equipment yet we often take them for granted, and we rarely examine them for chafing and wear (until it's too late). We have all seen "three strand" dock lines, but what about "nylon braided" dock lines. Which is better, three strand or nylon braided. What kind of dock lines do you use? What do you use to secure your boat? When it comes time to secure your houseboat to your dock, you typically want to use "spring lines" to reduce any potential damage. But what about using "nylon braid" lines? 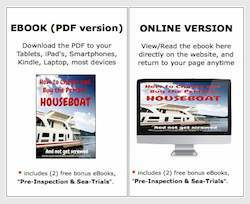 There's a special offer for you on our unique ebook on "How to Buy a Houseboat". The 135 page ebook is filled with tips, secrets, diagrams, and made to help you save time & money. It is now available in a PDF AND an "Online" version. * Tips on upgrading houseboat interiors, cabinets, and furniture. * How to not get screwed, when buying a houseboat. * How to locate houseboat HIN numbers and the boats history. * Houseboat water toys, what about an inflatable dinghy/motor? Here's some other important links to tips and information on buying a boat, transporting a boat, building a houseboat, insurance for houseboats, marine surveys, classified ads, and houseboat rentals. 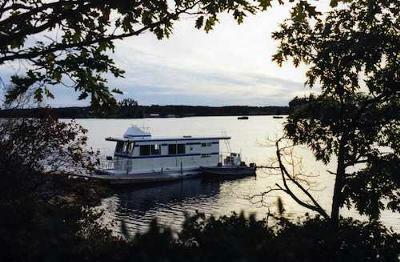 * Our "how to buy" a houseboat section.